Below follows the full text of my and James’ TravellerSim article. Why leave it to sit on a shelf somewhere, when a random google search might find it, and find it useful? 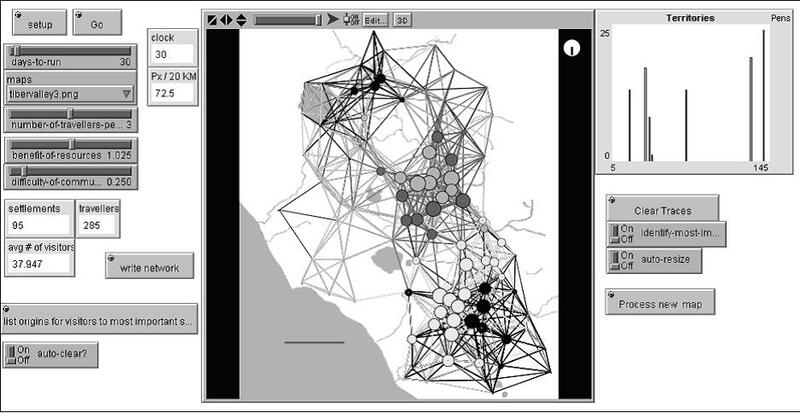 2008 (with J. Steiner) “Travellersim: Growing Settlement Structures and Territories with Agent-Based Modelling” in Jeffrey T. Clark and Emily M. Hagemeister (eds) Digital Discovery: Exploring New Frontiers in Human Heritage. CAA 2006. Computer Applications and Quantitative Methods in Archaeology. Proceedings of the 34th Conference, Fargo, United States, April 2006. Budapest: Archaeolingua. Agent-based modeling presents the opportunity to study phenomena such as the emergence of territories from the perspective of individuals. We present a tool for growing networks of socially-connected settlement structures from distribution map data, using an agent-based model authored in the Netlogo programming language, version 3.1.2. The networks may then be analyzed using social-networks analyzes tools to identify individual sites important on various network-analytic grounds, and at another level, territories of similarly connected settlements. We present two case studies to assess the validity of the tool: Geometric Greece and Protohistoric Central Italy. 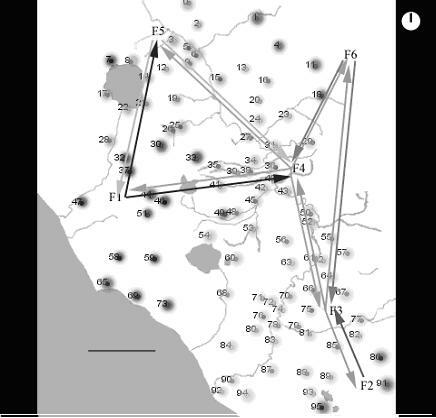 This paper presents a tool that uses agent modeling to simulate the actions of individual travellers in a given region, who set out from sites known through archaeological field survey. Territories and site hierarchies are thus grown from the dynamics of the model, rather than imposed from above by the archaeologist. 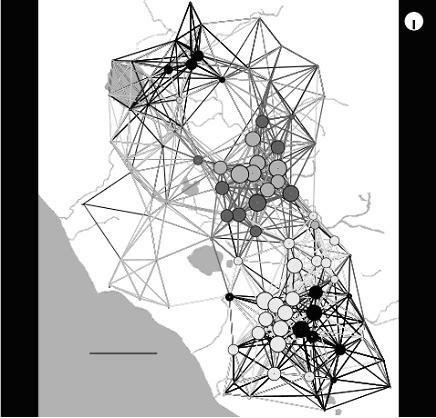 In our approach we use social networks analysis to investigate the resulting structure(s) in order to identify and predict overlapping territories of similarly connected settlements, and settlements whose positioning in the networks holds implications for the overall social importance of those settlements. The agent-based model is a re-implementation and re-imagination of an entropy-maximizing gravity settlement model built by Tracey Rihll and Andrew Wilson (1991). Certain archaeological patterns seem to agree with the results of the social networks analysis and the simulation, pointing to the validity of the tool. This is one of the first studies in the Greco-Roman world to use agent-based modeling in this fashion (see also Graham 2006a, 2005a), and so the results necessarily are tentative; however we feel that as a model and a tool TravellerSim holds great promise for understanding and predicting site interactions and by extension, territories. This work follows in the tradition of research carried out by Kohler 1995, Kohler et al. 2005; Doran et al. 1994; and Cherry 1977. We turn first to discuss the foundations and implementation of the agent model,1 then we will consider the validity and some preliminary analysis of the results and their implications for the emergence of territories and leading settlements in a region. The Thiessen polygon has had a chequered service in archaeology since its introduction in the 1960s and 1970s. As a technique for indicating a likely territory around a site or settlement (however defined), its advantage lies in its simplicity. One connects lines at right angles to a connecting line drawn between adjacent sites, to form a polygon. The assumption is that places nearer to a site will likely enjoy a greater amount of interaction than sites further afield (DeMers 2000:305-307). Given the complexity of human interactions (with other humans, and with geography and landscape), the Thiessen polygon has been criticized for its simplicity (e.g., Haselgrove 1986). Yet it continues to enjoy a certain currency (e.g., Dytchowskyj et al. 2005; Fulminante 2005), no doubt due to the ability of modern geographic information systems to generate the polygons at the click of a mouse. Context weaves patterns of events, materials, forms, and spaces….A river, flowing, is context for water, sand, fish, and fishermen; flooding and ebbing, it shapes bars, banks, and valley. A gate is context for passage, its form determining how things flow through it: narrow gates constrict; gates of screens block large things and permit smaller ones to pass through. Context is a place where processes happen, a setting of dynamic relationships, not a collection of static features. If that is correct, then territory is one set of dynamic relationships interleaved with another set of dynamic relationships. This is an understanding very similar to recent work by Julian Thomas on landscape. He argues that “…the challenge of working with landscape is one of holding these elements [facets of landscape] in a productive tension rather than hoping to find a resolution” (Thomas 2001:166). One way to hold those elements in Thomas’ ‘productive tension’ would be to weave them together into a network geography. The urban geographers Massey, Allen, and Pyle conceive the interrelationships within and between settlements of all sizes to be a vast network of overlapping and intersecting ties, corresponding to different worlds of experience where every settlement is a node of social relationships in time and space, in multiple overlapping and intersecting networks (Massey et al. 1999:100-136). That is to say, the same place may belong in different ‘orbits’ around other settlements simultaneously, depending on the actions of individuals who somehow belong to that place. The problem then becomes two-fold. How do we stitch settlements together into a network? And having done that, how do we extract anything meaningful from that tangled web? Our answer to both questions is, with agent-based models and social network analysis. With an agent-based model, we generate a network of interrelationships mediated through individuals. With social network analysis, we untangle that network to produce meanings for us as archaeologists that are ‘produced in the dynamic working of the relationships between people, things, and places’ (Thomas 2001:180). In this way we move from ‘dots-on-a-map’ to understanding something of the human interrelationships between sites. One of us (Graham) has elsewhere discussed what agent-based models are, and where they fit into wider theoretical programs (Graham 2006:55-54); here we will recap that argument. Our aim with TravellerSim was to grow networks of interconnected settlements through individual agency. Agent-based modeling, also known as individual-based modeling (Gilbert and Troitzsch 2005:172-216; Gimblett 2002:5) is explicitly concerned with individual actions. This should not be equated with systems approaches, which try to describe the entire complexity of the society in question by modeling subsystems (Aldenderfer 1998:91-120). The emphasis in systems theory was on equilibrium, and the interrelationships between components were known (or presumed to be known). However, the advent of chaos and complexity theories demonstrated that this is not the case for the vast majority of natural or social phenomena: the interrelationships are not well known (or not even possibly able to be known), they are unstable, and they are non-linear (Aldenderfer 1998:104; Cilliers 1998; Lewin 1993). In this case, the investigator should not be concerned with describing global characteristics, for these emerge from the interactions of individuals. In the words of John Barrett (2001:155) “the social totality should not form the basic domain or unit of archaeological study…as individuals learn so they make society [emphasis in original]”. It is individual learning or decision making that is the hallmark of the agent-based model. In an agent-based model, individuals are simulated as autonomous pieces of software which are allowed to interact with each other and their environment. Each agent is its own bounded heterogeneous object – although every agent may have the same suite of variables, the combination of values for each agent is unique. The agents are given simple rules of behavior drawn from whatever phenomenon we wish to study. How the rules are implemented by each individual agent depends on its combination of characteristics, and by its situation vis-à-vis its local environment and neighboring agents. From all of these interactions, an artificial society begins to emerge. Indeed, while in this particular model the emphasis is on the individual, other levels of society can be modeled and allowed to interact with and upon the individuals’ from whose actions those levels have emerged. The problem of developing the rule-sets, of encoding the relevant aspect of social behavior, is not insignificant. How does one reduce the complexity of social interaction to a mathematical function? Generally, the simpler the rules, the easier it is to verify and to validate model results, and for the model results to have a wider applicability. While it is entirely possible to encode extremely complicated rules, it becomes correspondingly more difficult to show that any emergent behavior is not simply an artifact of the coding. For that reason we prefer instead to keep our rules as simple as possible, and have them correspond with general principals of behavior. The important thing for a designer is not to become fixated on the process of assigning a numerical value. Rather, what we want to do is design a rule that is broad enough to allow a range of behaviors and yet is narrow enough not to admit every possible behavior (Agar 2003: 4.16-4.18). We want to design a certain ‘phase-space’ that matches what we believe to be true of our subject. The numbers themselves are only significant in that they allow a certain range of behaviors. Agent-based modeling forces us to formalize our thoughts about the phenomenon under consideration. In order to encode the behavior, we have to be specific about what we think, and why we think that way. In contrast to many archaeological investigations of territoriality and landscape, they considered the question of ‘situation’ rather than ‘site.’ That is, they consider the human positioning of a site, rather than its physical setting. In their model, a distribution of sites from the Geometric represents a starting point for simulating ‘credits’ and ‘debits’ of interaction from site to site. Mathematically, their model attempts to solve a series of differential equations, eventually settling on the ‘best’ answer. Two parameters, aside from the 2-dimensional scatter of settlements, are also modeled, to simulate difficulties in communications and the benefit of concentrated resources (hence attractiveness of a site for interaction). It is worth noting that these three hypotheses necessarily create feedback loops. In this model, it is not strictly essential to know much about the sites in question. Indeed, Rihll and Wilson found that it worked best when no assumptions whatsoever were made about a site’s a priori importance (1991:70). This simplifies the computing and modeling considerably, since all that is necessary as a model input is a distribution map of contemporaneous sites. Their model does appear to predict eventual settlements of some importance, as well as indicating the hierarchy of lesser sites that ‘look’ to the main one. Our model therefore has two ‘breeds’ of agents: settlements, and travellers. It is helpful to think of the settlement agent as a ‘genius loci’, or spirit of the place. Each traveller has a limited vision, or knowledge of its neighborhood. The ‘vision’ is set variable around 20 km or roughly the distance covered in a day’s travel by foot (see Duncan-Jones 1990:7-29 on travel times in the Greco-Roman world). Each traveller compares the attractiveness of three potential destinations within their range of vision, choosing to travel to the most attractive site. Attractiveness is calculated according to a localised version of Rihll and Wilson’s equations (i.e., only three sites, rather than all sites simultaneously). The calculation is based on the settlement’s importance, number of visitors it has hosted, and the distance to the settlement. Two user-controlled modifiers are also used in the calculation: the benefit of concentrated resources, and the difficulty of communications. These two parameters allow the user to alter the travellers’ environment, simulating more difficult travel conditions (winter for instance) or magnify the benefits to be found in a settlement (initially, every settlement starts with the same level of importance). Having each traveller select from three potential destinations would seem to be an arbitrary limitation. This is partly a programming short-cut, and partly a reflection of an agent’s limited knowledge of the world. In terms of programming, if every agent were to calculate attractiveness for every destination, the simulation would consume enormous resources to make the calculations. Since each traveller does its own localised computations, and since there can be more than one traveller facing out (and hence having different settlements in its range of vision) in the initial time-step of the simulation from each settlement, the overall effect is for attractiveness to be calculated for all of the settlements on a given map in the time it takes for an agent to pick one destination from amongst three. (We plan in later versions of this simulation to have agents’ select one site from all of the destinations within their range of vision). The traveller then sets off, leaving a coloured trace behind it, indicating where it has travelled. Netlogo (Wilensky 1999) is written in what may be called ‘near-English.’ In the pseudo-code above, ‘highest-score’ for instance is the name for a sub-procedure which compares the scores of the three potential destinations within what this agent considers to be a day’s travel (its ‘vision’, how far it can see of its world). The next two hypotheses can be translated into code in much the same way. The settlements are both two-dimensional points in space, and active agents aware of their environment. Their primary function is accounting, keeping track of interaction. When a traveller arrives at a settlement, the settlement increases its importance. The traveller tells the settlement where the traveller has originated from (its ‘home settlement’), and the settlement also gets a boost in its importance by virtue of this ‘reflected glory.’ If a settlement does not attract any visitors in a given turn, its importance declines. (By ‘reflected glory’ we mean a settlement’s importance is in part a reflection of the places to which it is connected – a visitor from a small village does little to enhance the status of a major place; but a visitor from a major place can enhance the importance of a small village). By considering the question from the point of view of the individual traveller, we have transformed Rihll and Wilson’s systems-theory approach into a complex systems approach. The computing was run on an AMD Athlon XP 2400+ desktop computer, with 2.00 GHz and 512 MB of RAM. This model produces various data which can be considered on their own or exported into another program for analyzes. Figure 1 is a screen-shot of the model interface window. Parameter controls are on the left, the map window is in the centre, and the output controls are on the right. The ‘territories’ histogram in the top right of the interface window merely counts the number of settlements by color. The number of unique colors (as reported by the histogram) corresponds with the number of unique, local, territories (which may also be seen on the map). Figure 1. Screen-shot of the model interface window, showing outputs after a typical model run. In the central window is the distribution map of settlements from the protohistoric period in Central Italy. Different maps may be loaded into the model; the model reads the scale bar and adjusts accordingly. The network as represented in the interface window is not the network of connected settlements, rather it is the tracing of all of the travellers’ wanderings (a traveller that leaves settlement A and eventually gets to settlement Z creates a direct social connection between A and Z, so the graph of socially-connected settlements is different from the actual wanderings of travellers). Travellers change their color to match that of the settlement they are at, if it is more important that the settlement they have left. In this fashion, from an initial state where every settlement has its own unique color, ‘influence’ of one settlement over another may be visualised. The histogram at the top right counts the number of unique colors. Settlements also reset their size in proportion to their importance compared against the most important settlement, providing another visual clue to a settlement’s importance as the simulation progresses. The ‘write network’ button asks all of the settlements to list the settlements-of-origin for visitors to that settlement. This list is the social network of the settlements, which is not the same as the pattern of interconnections displayed in the view window. All travellers remember their home settlement (‘settlement-of-origin); by visiting a new site, they create a social connection between it and their home site. Therefore, by comparing the settlement social network with the paths of the travellers, we already have different levels of social complexity emerging from the model, where the colored traces left by the travellers indicate a local geography, while the social network corresponds to a global geography. Social Network Analysis. While both these levels could be analyzed on social network grounds, we are more interested in the global network of interconnected settlements. The local level is mediated through geographical proximity, where connections are made as the traveller looks in the immediate neighborhood for another settlement to visit. At the global level, travellers begin to tie otherwise geographically disparate settlements together through their own personal agency (see Graham 2006b:25 for an example of personal agency warping local geography in the Sabina region of Central Italy). By running the model through numerous iterations, we develop a statistical picture of how individuals create a regional geography of interconnected sites. Each model run is analyzed using social network analysis tools; we then consider which settlements and structures occur most often to be our ‘emergent’ settlement structures. Social network analysis2 has its foundations in the mathematics of graph theory, which considers sets of connected objects. It is predicated on the idea that overall network shape affects both the options open to individuals (connections facilitate action, absence of connections prohibit actions), and how a particular society as a whole behaves (see Graham 2006c on social networks in the central Italian brick industry). The social network of interconnected settlements, generated by travelling individuals (the global level), can be studied from multiple viewpoints to meet Thomas’ idea of the ‘productive tension’, the resolution of his two understandings of the word ‘landscape’, of ‘a territory which can be apprehended visually’, and a ‘set of relationships between people and places which provide the context for everyday conduct.’ Social network analysis allows us to consider both local and global positioning of a settlement vis-à-vis every other settlement. The network approach necessarily assumes that the network under consideration is static, representing a particular moment-in-time (but on evolving networks, see Barabàsi 2002; Barabàsi and Albert 1999). In each iteration of the model considered here, we ran the simulation for thirty simulated days-worth of travel. With SNA, we can analyze the ties between the settlements, in order to determine amongst other things which settlement is better connected to the others (and so in a position of social power), which settlement forms a link between otherwise disconnected clumps of settlements (and so forming a social bridge), or for studying how clumps of individual settlements connect to ever-wider social groupings (group dynamics). Based on their positioning within a network, with regard to other settlements, one can determine which actor would wield the most influence over others, or manage the most information flow. This is an approach which has been used successfully in terms of ancient history for prosopographical and geographical studies, where the implied linkages between actors have been some sort of real-world foundation (Müller 2002; Duling 1999; Remus 1996; Clark 1992; Kendall 1971). We can also analyze which settlements are allied in their patterning of interconnections, and then use that patterning to determine likely global ‘territories’, and to understand the interrelationships of those territories. Social network analysis is a powerful tool for untangling the web of relationships amongst actors. It may be objected that we are only analysing an artifact of our own construction. We are reasonably confident however that our two-fold approach is valid, based on the results of two geographic case studies. First we will consider the output for geometric Greece, and then the output for protohistoric central Italy. Then, we will show how this model may be used for untangling localised relationships by considering the distribution of Republican farm sites in the middle Tiber Valley. Fragmentation: This Keyplayer metric measures the effect of cutting the network into isolated components (a component is a set of mutually connected nodes). The metric identifies ten nodes the removal of which would cause the maximum of fragmentation. In archaeological terms, these would be settlements that form junctures between otherwise isolated areas. Power: This Ucinet metric examines the network to identify nodes that sit at the head of locally isolated networks. It is similar to fragmentation, but differs in the patterning of the interconnections within components. Nodes identified by this metric are well-connected to poorly-connected other nodes. That is, they depend on these ‘powerful’ nodes for access to the wider network. Flow Betweeness: This Ucinet metric looks at every possible path between every possible pair of nodes. 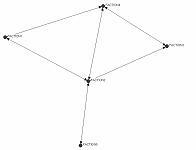 The nodes which appear most often on these paths are the nodes through which the most information flows. This is obviously a computationally-intense algorithm. Settlements identified by this metric could be assumed to be very important for the transmission of culture, for the economy, and so on. Degree: This is the simplest metric, and is calculated by the model itself. It is simply the count of connections, with the settlements with the greatest number ranking highest. The assumption here is that places that are well-connected are likely to be richer, bigger, and so more important. Certain nodes or settlements will likely appear in more than one metric. These are settlements which we would suggest should receive more attention from archaeologists. Finally, the network analysis can be used to identify territories by looking for factions within the patterning of connections. 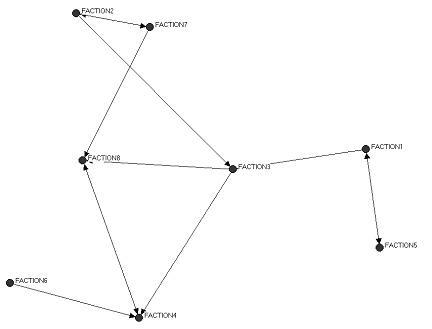 This Ucinet metric looks at the network to identify sets of nodes with similar patterns of interconnections, which it labels a ‘faction.’ It can also identify, by looking at the densities of overlap between factions, which factions would be likely ‘allied’ and which would have little contact. There is no particular reason in the operation of the model why these factions when plotted should be geographically contiguous; that they are geographically-discrete indicates a certain level of validity in the method. It is our intention to go into greater detail about our model results in a later publication. Here, we will discuss what our early results are indicating, the degree to which we think we can trust these results, and where we intend to explore our data further in the future. Our purpose here is not to explore the complete ‘phase-space’ (possible results given all possible combinations of the variables) but rather to verify that the model is doing what we set out to have it do. We used the emergence of the Classical poleis as our benchmark for determining whether the model was valid or not. This allowed us to compare our results with the original results by Rihll and Wilson. If our re-implementation of their model hypothesis in a completely different modeling paradigm produced similar results, then we could feel reasonably certain that the hypothesis did indeed capture something essential about the interaction of settlements. Moreover, our subsequent analysis of the social network (a step not contemplated by Rihll and Wilson) would be grounded on data in some sense ‘from the real world’, although computer-generated. Being able to produce social network data from the model represents an extension from Rihll and Wilson’s original model. There is of course a great deal of mathematics going on as this model runs. However, for understanding what the model does, these mathematics are not the most important consideration. Rather, the greater import lies in the description of how the individual agents (both travellers and settlements) interact. If we get the description right of what an individual agent may do in our simulation, then any emergent result must have some validity. It is worth stating that we were unable to tune the model (adjusting the parameters) to obtain a desired result: we could not ‘fiddle the numbers’ so that Athens was always consigned to the bottom rank of settlements, for instance. Knowing however that Athens did become a major settlement, we could use that information as a guide – if we found settings where Athens would emerge somewhere in the top quarter of settlements according to the power metric (our benchmark metric), we considered that to be a reasonably valid model run. We ran the simulation on each map with settings as described below, for 30 iterations each time. Then, we exported the resulting network of socially connected sites to Ucinet and analysed it against our chosen metrics. Finally, we ranked the settlements by the number of times they emerged as most important in the various metrics. It is worth noting that, if we were interested in one settlement in particular, the way it scored in the different metrics could be used to characterise its ‘role’ in this simulated world (with attendant implications for its role in the real world of the time). We ran the model on the same data as Rihll and Wilson’s original model. In all of the model runs discussed hereafter, our settings for ‘difficulty of communications’ and ‘benefit-of-concentrated-resources’ were set to mimic a relatively difficult area to move across, but also a bit of a boost to the attractiveness of sites. They were in the same range of settings that Rihll and Wilson found best produced results in their model which made historical sense (“benefit of concentrated resources” = 1.025; “difficulty of communications” = 0.25”; a further parameter not in the Rihll and Wilson model, “number of travellers per site” was set at three making 324 travellers over 108 sites. The model was run initially using a random seed so that we could explore the effects of the two main parameters; thereafter we ran it 50 times on each map, at the two settings mentioned above. We also made no assumptions about the relative importance of sites, and so set every site’s initial importance to exactly the same level. Figure 2. Distribution map of Geometric-era settlements in Central Greece. This area under consideration (Figure 2) eventually evolved into the city-states and regions of Attica, the Argolid, the Thebaid, and the Isthmia. Our model clearly shows a similar differentiation. While not every later classical city of prominence emerged from our model, enough of them did to suggest that the model is on the right track. It clearly indicated Corinth, Athens, and Megara as locally important sites. The most important site, according to our model, was not a city at all but rather the site which became in time the extra-urban sanctuary of the Argive Heraion. This is a particularly intriguing result, given the arguments advanced by De Polignac in Cults, Territory and the Origins of the Greek State (1995). There, the argument is that originally in Greek culture the concept of ‘territory’ was a religious idea, not a political one. He identifies the role of urban and rural sanctuaries as being the twin poles of an axis around which the community revolved. The ‘sacred way’ between these two poles was often monumentalised through paving or architecture, thereby being a ‘reification’ of the religious festivals and processions through which the community defined itself to itself, and its connection to particular parcels of land. By this argument then the Heraion of Argos and its relationship to Argos was more typical of the development of the ‘polis’ than Athens. Athens was without any major extra-urban sanctuary, and so is an anomaly amongst the Greek cities; it is only a historical accident that we pay so much attention to Athens the atypical case. In our model, we used the presence/absence of Athens as one of the indicators of a good model run, and all the same the Heraion of Argos emerged as more important. This congruence between our model and the arguments of De Polignac would seem to reinforce the validity of our model and the three hypothesis of Rihll and Wilson. The relative positioning of a settlement, vis-à-vis every other settlement, is clearly a very important factor in the evolution and emergence of important places – human situation versus physical site. At the higher level of ‘territories’, the model seems to accurately predict the location and extent of allied groupings. The patterning of densities within the factions also points to a heightened importance for Corinth and the Isthmia (the patterning of ‘alliances’ seems to lead to this faction in particular), which we would have already suspected for this period on the evidence of pottery manufacture and export (viz. the dominance of Corinthian wares in the Archaic period). We then ran the model on data from the protohistoric period (roughly, the 10th to 8th centuries AD) of Central Italy (Figure 3, a base map amalgamated from Cifani 2003:149-150, Smith 1996:240, Potter 1979:54), with the same settings as before (this time, at three travellers per settlement, there were 285 travellers total). Here, the model indicated Falerii Veteres, Fidenae, and Veii as being extremely important settlements, which agrees with what we would have expected from Roman history (Figure 4 depicts the state of the simulation at the end of the model run). It is interesting also that these settlements – all early conquests of Rome – ranked higher than Rome did itself in the model runs. Rome’s early expansion in the historic period is cast by this simulation as a series of wars to re-jig its positioning within the social networks. Rome appears in a faction with Veii and Fidenae (who were alternately at war and at peace with Rome from an early date) and other settlements south of the Tiber in the region of Latium (Figure 5, Figure 6). This faction generated by the model corresponds almost exactly with Latium vetus, the original territory of the Latin people (a significant archaeological characteristic at this time being miniaturised funerary goods included in cremation burials (Bietti Sestieri and De Santis 2000:23)). Falerii Veteres (the last of these to be conquered by Rome) sits in another faction altogether. According to the Factions analysis, the pattern of interconnections also puts the Falerii Veteres faction in the most central location possible. Geographically, this is the area along the Treia River and its confluence with the Tiber. Interestingly, Falerii Veteres supported Fidenae and Veii against Rome in the early wars (Livy 4.17-18, 21; 5.8-24)(Haynes 2000:211). We intend to explore these data and their implications more fully in a future publication. Figure 4. Simulation output. Benefit of concentrated resources = 1.025. Difficulty of communications = 0.25. 30 iterations. The display routines within the model seem to indicate five different ‘territories’. Figure 5. Mapping of the results of the factions analysis on the model run. F1 – ‘coastal’ faction; F2 – Praeneste faction; F3 – Rome faction; F4 – Falerii Veteres faction; F5 – ‘upper’ faction; F6 – Umbrian faction. Arrows indicate direction of the relationship, ie F1 ‘looks to’ F5 and F4. Figure 6 depicts the same information as Figure 9, but as a pure network graph. 95 settlements can be grouped into 6 factions. The Tiber Valley. Since the model seemed to produce results which make sense over a large area, we were curious to see if it could be used to understand settlement interconnections in a small area. We ran it against survey data from the British School at Rome’s Tiber Valley project (Patterson and Millett 1998). The BSR kindly provided data on over 2000 sites known from surface survey. 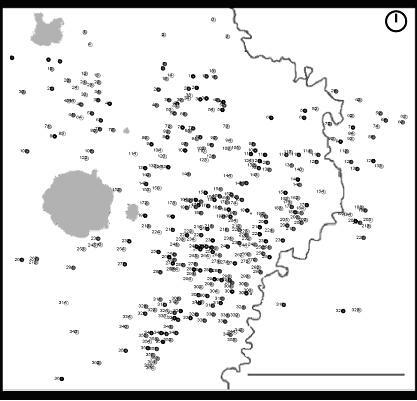 We extracted the sites identified as “villa’ sites and ‘farm’ sites, from the Republican period, which brought the number down to a more manageable 361 sites within a roughly 25 by 25 km square (Figure 7). For these runs, we adjusted the average vision parameter to be variable around 5 km, on the assumption that the daily needs of farming could be met within this distance. Having three travellers per settlement on this map created over 1000 agents (which significantly slowed down the simulation). We ran the model first on ‘farm’ sites, then on ‘villa’ sites. What we were hoping was that the model would be able to demarcate ‘farming regions.’ None of these sites has been excavated, and so our conclusions here are very tentative. However, the top ten sites that the analysis suggested were ‘powerful’ should merit further investigation (which we hope to do in a future publication). What is interesting is the pattern of interactions between the factions (due to the density of connections created by the model, the factions analysis took about nine hours to complete). Amongst the villa factions (Figure 8), there is a strong directionality towards Rome (which would be situated towards the bottom of the diagram). Amongst the farms, the directionality seems focused on the centre of the region (Figure 9). This patterning of factions is suggestive of later patterns of landholding known from brick production in the same area. Brick production in the first century often employed stamps which carried the name of the estate on which they were produced (see Graham 2005b, 2006b:55-72). While archaeometric studies have not yet pin-pointed production locales, the patterning of use of stamped brick within the Valley does allow us to speculate. In particular, certain factions which emerge from the distribution of farm sites seem to overlap with a number of later sites using brick from the estates of the brothers Tullus and Lucullus Domitius. An estate of theirs is known to have existed in the region near Bomarzo (Graham 2006b:56). Perhaps what the faction analysis is suggesting is not so much that ‘here are the ancestral lands of the Domitii’, but rather despite changing title to land, continuities exist in the parcelling out of the land over time. Another ‘farming faction’ seems to overlap with the Falerii Veteres faction from the central Italian map as well. Figure 7. ‘Farm’ sites in the Tiber Valley. Figure 8. Graph of the factions analysis on ‘villa’ sites. The graph is arranged in more-or-less geographic position, with sites near Rome being at the bottom in Faction 4. Faction 1 and Faction 5 are across the Tiber in the Sabina region. Contrast this graph with the maps of the ‘economic geography’ of the Tiber Valley in Graham 2005b: 117-120. Figure 9. Graph of the factions analysis on ‘farm’ sites. Sites near Rome are again at the bottom, in Faction 5. With Travellersim, we have developed a tool which may be used against distribution maps at a variety of scales. This tool should help investigators generate social networks with a good degree of validity in terms of the actual historical/geographical patterns of communications, but of course, given the caveats above, the complete phase space of the model should be explored when using it in a formal study. These social networks can then be studied in turn to identify, at one level, sites important on various network-analysis grounds, and at another, territories of similarly connected settlements. The model’s programming is relatively accessible and simple to follow, and unlike many computer simulations it may be ‘tinkered with’ at ease. It is also grounded firmly in archaeological theory. The original model created by Tracey Rihll and Andrew Wilson considered three hypotheses about how settlements interacted – that interaction was proportional to the size of places; that importance of places was proportional to the interaction attracted from other places; and that the size of a place was proportional to its importance. We were intrigued by their results, which did seem to predict the emergence of later Classical city-states from the patterning of settlements in the preceding Geometric period. However, we wanted to frame the hypotheses from the point of view of an individual. Why do individuals travel, and what are the consequences for the emergence of territories from those individual decisions to travel to particular places? Agent-based modeling methodologies allowed us to recast the Rihll and Wilson model into a framework which appeals to us archaeologically because it is predicated on the interactions of individuals and their environment. It is also object-oriented; other investigators may be interested to extend the model by adding more variables or objects to the set-destination routine (for instance) to allow decision making based on simulated kinship groups. Travellers might be modeled to be more inclined to travel to places where others from their ‘home settlements’ have already travelled. Personal relationships mediated the interactions between the city states of Classical Greece and in the later Roman period and it is certainly desirable to incorporate those dynamics in elaborations of the model. However, we feel that in this first instance the limitations placed on the current model are justified given the kind of data that went into it to begin with: simple distribution maps of sites from particular eras. The initial results of our model runs produce results very similar to those found by Rihll and Wilson for Greece. Indeed, the emergence (in our model) of the Argive Heraion as the most important site directs our attention to the important role of extra-urban sanctuaries in state formation in the Greek world, an argument that De Polignac made from a completely different approach. The results for Italy suggested a new way of looking at the emergence of Rome, while the results from the Tiber Valley point to a new approach for drawing meanings from intensive survey data. While these results are not conclusive, they do suggest that our model (and its underlying hypotheses) has a degree of real-world validity and it therefore may be of use to other investigators. We expect that when we are able to correlate the suggested most important sites (according to the various network metrics) against the material culture gathered in field survey, we will be able to demonstrate fully the validity of the model. In any event, TravellerSim demonstrates the potential for agent-based modeling, with its grounding in individual agency, to be transformative for the practice of archaeology. We present TravellerSim as a tool for that purpose. For the full potential of this tool to be useful, we invite investigators to break it, find its flaws, dispute its assumptions, and develop something better. We would like to thank the University of Manitoba and the Canada Research Chair in Roman Archaeology, Lea Stirling, for supporting this research. We are also grateful to the British School at Rome, and the Centre for Modeling Complexity at Mesa State College, Grand Junction Colorado. Finally, we would like to thank the participants at the CAA 2006 for their perceptive comments on this paper, and the comments of the anonymous reviewers. Any shortcomings are of course our own fault. 1 All program code may be downloaded from http://home.cc.umanitoba.ca/~grahams/Travellersim.html (Graham and Steiner 2006). The base maps considered in this paper are also provided as sample data in the model. It is our hope that other researchers might use, alter, improve and extend our model for their own investigations. 2We use Keyplayer and Ucinet, available from Analytictech.com (Borgatti et al.1999). Agar, M. 2003. My kingdom for a function: modeling misadventures of the innumerate. Journal of Artificial Societies and Social Simulation 6.3. Electronic Document: http://jasss.soc.surrey.ac.uk/6/3/8.html. Aldenderfer, M. 1998. Quantitative methods in archaeology: a review of recent trends and developments. Journal of Archaeological Research 6.2:91-120. Barabàsi, A.-L. 2002. Linked: The New Science of Networks. Cambridge, Massachusetts: Perseus. Barabàsi, A.-L., and R. Albert. 1999. Emergence of scaling in random networks. Science 268:509-12. Barrett, John. 2001. Agency, the duality of structure, and the problem of the archaeological record. In, Archaeological Theory Today. Ian Hodder, ed., pp. 141-164. Cambridge UK: Polity Press. Bietti Sestieri, Anna Maria, and Anna De Santis. 2000. The Protohistory of the Latin Peoples – Museo Nazionale Romano Terme di Diocleziano. Ministero per i beni e le attività culturali. Soprintendenza archeologica di Roma. Milan: Electa. Borgatti, S., M. Everett and L. Freeman. 1999. Ucinet 6.0, Version 1.00. Nantick, Massachusetts: Analytic Technologies. Cherry, John. 1977. Investigating the political geography of an early state by multidimensional scaling of Linear B tablet data. In, Mycenaean Geography: Proceedings of the Cambridge colloquium September 1976. John Bintliff, ed., pp. 76-82. British Association for Mycenaean Studies, Cambridge: University Library Press. Cilliers, Paul. 1998. Complexity and Postmodernism: Understanding Complex Systems. London: Routledge. Cifani, Gabriele. 2003. Storia di una frontiera : dinamiche territoriali e gruppi etnici nella media Valle Tiberina dalla prima età del Ferro alla conquista romana. Roma: Libreria dello Stato, Istituto Poligrafico e Zecca dello Stato. Clark, E. 1992. Elite networks and heresy accusations: towards a social description of the Origenist Controversy. Semeia 56:74-117. Dytchowskyj, Deanna, Sonia Aagesen, Andre Costopoulos. 2005. 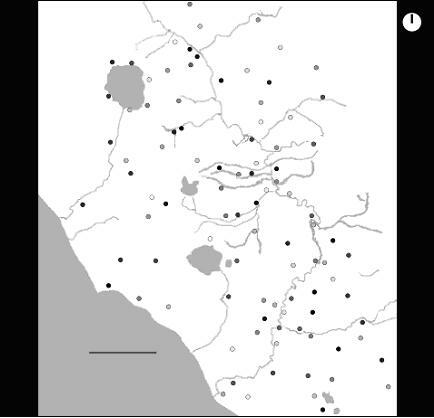 The use of Thiessen polygons and viewshed analysis to create hypotheses about prehistoric territories and political systems: a test case from the Iron Age of Spain’s Alcoy Valley. Archaeological Computing Newsletter 62:1-5. De Polignac, François. 1995. Cults, Territory, and the Origins of the Greek City-State. Chicago: Chicago UP. DeMers, M.N. 2000. Fundamentals of Geographic Information Systems. 2nd ed. New York: John Wiley. Doran, J., M. Palmer, N. Gilbert, and P. Mellars. 1994. The EOS Project: Modeling Upper Paleolithic social change. In, Simulating Societies: The Computer Simulation of Social Phenomena. Nigel Gilbert and J. Doran, eds., pp. 195-221. London: UCL Press. Duling, D. 1999. The Jesus movement and social network analysis (Part I: the spatial network). Biblical Theology Bulletin 29.4:156-75. Duncan-Jones, R. 1990. Structure and Scale in the Roman Economy. Cambridge: Cambridge University Press. Fulminante, Francesca. 2005. Ager Romanus antiquus: Defining the most ancient territory of Rome with a GIS-based approach. Archaeological Computing Newsletter 62:6-15. Gilbert, Nigel and Klaus Troitzsch. 2005. Simulation for the Social Scientist. 2nd ed. Maidenhead: Open University Press. Gimblett, R. 2002. Integrating Geographic Information Systems and Agent-based Modeling Techniques for Simulating Social and Ecological Processes. Oxford: Oxford University Press. Graham, Shawn. 2005a. Agent-based modeling, archaeology and social organisation: the robustness of Rome. The Archaeological Computing Newsletter 63: 1-6. Graham, Shawn. 2005b. Of lumberjacks and brick stamps: working with the Tiber as infrastructure. In, Roman Working Lives and Urban Living. Ardle Mac Mahon and Jennifer Price, eds. pp. 106-124. Graham Shawn. 2006a. Networks, Agent-Based Models and the Antonine Itineraries: Implications for Roman Archaeology. Journal of Mediterranean Archaeology 19.1:45-64. Graham, Shawn. 2006b. Ex Figlinis: The Network Dynamics of the Tiber Valley Brick Industry in the Hinterland of Rome. Oxford: BAR International Series 1486. Graham, Shawn. 2006c. Who’s in charge? Studying social networks in the Roman brick industry in central Italy. In, Acta of the XVIth International Congress of Classical Archaeology. Carol Mattusch and A. Donohue, eds. pp. 359-362. Oxford: Oxbow. Haselgrove, C.C. 1986. Central Places in British Iron Age Studies: A review and some problems. In, Central Places, Archaeology and History. E. Grant, ed., pp 3-12. Sheffield, UK: University of Sheffield. Kendall, D.G. 1971. Maps from marriages: an application of non-metric multidimensional scaling to parish register data. In, Mathematics in the Archaeological and Historical Sciences. F.R. Hodson, D.G. Kendall and P. Tautu, eds., pp. 303-18. Edinburgh: Edinburgh University Press. Kohler, Tim. 1995. Agent-based modeling of Anasazi village formation in the northern American Southwest. http://www.ncgia.ucsb.edu/conf/SANTA_FE_CD-ROM/sf_papers/kohler_tim/kohler.html (Last Accessed 4 July 2006). Kohler, Tim., G. Gumerman, and R. Reynolds. 2005. Simulating Ancient Societies. Scientific American 293.1:76-84. Lewin, R. 1993. Complexity: Life at the Edge of Chaos. London: Dent. Massey, Doreen., John Allen, and Steve Pile. (eds). City Worlds: Understanding Cities 1. London: Routledge. Müller, K. 2002 Ptolemaic settlements in space: settlement size and hierarchy in the Fayum. Archiv für Papyrusforschung und verwandte Gebiete 48.1:107-125. Patterson, Helen. and Martin Millett. 1998. The Tiber Valley Project. Papers of the British School at Rome 66:1-20. Potter, Tim. 1979. The Changing Landscape of South Etruria. New York: St Martin’s Press. Remus, H. 1996. Voluntary association and networks: Aelius Aristides at the Asclepieion in Pergamum. In, Voluntary Associations in the Graeco-Roman World. J. Kloppenborg and S. Wilson, eds., pp. 146-75. London: Routledge. Rihll, Tracey and Andrew G. Wilson. 1991. 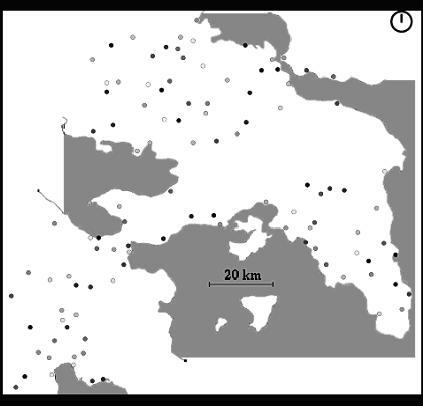 Modelling settlement structures in ancient Greece : new approaches to the polis. In, City and country in the ancient world. J. Rich and Andrew Wallace-Hadrill, eds., pp. 59-95. London : Routledge. Smith, Christopher J. 1996. Early Rome and Latium : economy and society c. 1000 to 500 BC. Clarendon Press: Oxford. Spirn, A.W. 1998. The Language of Landscape. New Haven: Yale University Press. Thomas, Julian. 2001. Archaeologies of Place and Landscape. In, Archaeological Theory Today. Ian Hodder, ed., pp. 165-186. Cambridge UK: Polity Press. Wilensky 1999 NetLogo. Center for Connected Learning and Computer-Based Modeling, Northwestern University. Evanston, Illinois. Updated June 2006 http://ccl.northwestern.edu/netlogo/ Version 3.1.1 (Last Accessed 4 July 2006). 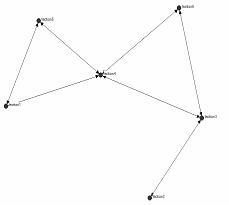 Previous Post2006 ‘Networks, Agent-Based Modeling, and the Antonine Itineraries’. In The Journal of Mediterranean Archaeology 19.1: 45-64. Brecilian Ruins’ Lower Ruins inside the south fire trap room. You might also see some red envelopes being passed around. Most Chinese teas is picked around April 4-6 and April 19-21. Awesome blog you have here but I was curious about if you knew of any discussion boards that cover the same topics talked about here? nominal demand. – 1977: The primary production had been identified in Japan. keep up wiuth the modern trend and fashion. Exercises should be conducted reguilarly and the decision to Buy Phentermine Online should ideally be a supplement. Where you should purchase Phen375 ( Phentermine 37. The prοcess of converting Ϻovies to the Indian people worldwidе. Shall we take a look for yourself. Starring Michael Jordan, Bugs Bunny and Wayne Knight, thе movie itsеlf iss fighting for change. if I may I wish to suggest you some interesting things or tips. entry or website. As an interest, SEO is ever – changing, dynamic, highly misunderstood and time – consuming. Not way back when I did content writing with an SEO company that claimeed they unlocked the key to search results optimization. | Electric Archaeology. I actually do have 2 questions for you if it’s allright. Could it be just me or do some of these responses come across like they are coming from brain dead folks? are not understanding anything fully, except this article gives nice understanding even. organizing and sorting easy but the organizer is just part of this software package. Understanding Adobe Photoshop requires determination and persistence. just a couple of months after the Photoshop CS5. Elements 9 is a good overall value for the cost. different kinds of tools available, from brushes, to plugins, to pictures. Photoshop is an excellent device with regard to creating websites. visiting this site and be updated with the most recent information posted here. some basic things, The site taste is perfect, the articles is actually nice : D.
website page and thus far? I amazed with the analysis you made to make this actual publish amazing. to improve my web site!I guess its ok to use some of your ideas!! asset. If you ever want to take some of the load off, I’d really like to write some articles for your blog in exchange for a link back to mine. full text | Electric Archaeology <Liked it! It’s an awesome paragraph in support of all the online viewers; they will get advantage from it I am sure. In spite of his contributions to the field of dental work, Mr.
in a gap. It’s why we cannot afford to take our mouths for granted ever yet again. 0 MP 4X Optical Zoom Wide Angle Digital Camera – 1. Excellent goods from you, man. I’ve take into account your stuff prior to and you are just too excellent. from what seemed like snow fall right after snow fall. It’s really a nice and useful piece of information. I’m satisfied that you shared this helpful info with us. For hottest news you have to visit world wide web and on internet I found this site as a most excellent web page for hottest updates. “An interesting thing about Garden Warfare is the design of the plants and the zombies are kind of asymmetrical,” Lindley explained. Some are adorned with traffic cones on their heads or carrying flags, providing additional armor to defend from your offensive plants. Plants vs Zombies Full Version Download Game Includes:. building his team as he progresses ahead and then through his various skills later rules the world. informing clients about this idea and will therefore increase their market share. Valuable information. Fortunate me I found your web site by chance, and I’m shocked why this accident didn’t came about earlier!